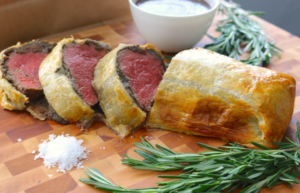 Beef Wellington: the Ultimate recipe! To continue our review for Christmas meals, after the Christmas cake, I suggest this recipe. Brush the top of the pastry with egg wash then make a couple of slits in the top of the pastry using the tip of a paring knife — this creates vents that will allow the steam to escape when cooking. Bake for 40 to 45 minutes until pastry is golden brown and beef registers 125 degrees F on an instant-read thermometer. Remove from oven and rest before cutting into thick slices. Garnish with minced chives, and serve with Green Peppercorn Sauce, Roasted Fingerling Potatoes with Fresh Herbs and Garlic, and Warm Wilted Winter Greens. Cook honey and balsamic together over medium-high heat in a large saute pan, about 5 minutes. Toast walnuts in a small skillet; set aside to cool. Pile greens on a platter. Stir mustard into balsamic-honey dressing, then whisk in about 1 cup extra-virgin olive oil; pour over greens. Season greens with salt and pepper and garnish with walnuts, pomegranate seeds, shavings of Parmesan, and shallot.